I'm back from my New Hampshire vacation, and ready to share a card I made a while ago. I sent this card recently to a friend to let her know I was thinking about her, as she seemed to be having a bit of a hard time. I used a technique I learned from a PTI Make it Monday video on cracked glass using UTEE. I decided not to crack these little tea cups, but did pop them up with dimensionals and stacked them. If I were a better photographer, you would see the gloss on the teacups that make them look a little bit like real china. This card is for my daughter to give to a friend on the occasion of her becoming a Bat Mitzvah. I used the color scheme of the invitation in my card. I like a gate fold for a Bat Mitzvah card because it reminds me of the way the ark opens to reveal the Torah inside. The person becoming a Bar or Bat Mitzvah has the honor of reading from the Torah for the first time. My friend Cathy Weber had sent me several stamped images of this little jar, which I fell in love with when she used it in a card she sent me. Cathy also gave me the IO Cover a Card Damask stamp, which I used to make the background on the red mat. One of my best friends is training for her first triathalon. She is training with 'Team in Training' and is competing to honor her brother, who recently won his battle with lymphoma. You can find out more here. This is the second in a series of cards I am sending her. The first card was to encourage her for her 10k run. This card is to encourage her for the 40k bike ride. The last card will be to honor her 1.5 k ocean swim. One of the interests she and I share is reading, so I made her a matching bookmark to use during those spare moments when she is not training. I just received my new Papertrey Seed Packet Die, and I can't seem to stop making little packets. I was inspired by a gift I received from Monica, and the post where she wrote about her ideas for this die. Basically, I have been cutting and taping anything I can get my hands on, and it's just been a blast. Here are some seed packets I cut out of wax paper. The packet on the left is regular wax paper. To the right is wax paper embossed with the Sunshine Impression Plate. You can't really see the impression in the picture or in real life. The next two are cut from wax paper and then run through the Cuttlebug with a Square Lattice and Houndstooth embossing folders. The one on the right is some wax paper I had left over from last holiday season, that had snowmen and snowflakes printed on it. Here is a close up of the wax paper packets that were embossed before assembling. (Now, I am wondering if it might work even better if I had taped them together before embossing--another project for another day). Here is a better view of the wax paper with the snowman pattern. These are so cute. I'm going to check Target to see what other patterned wax paper they have. These would be cute for Halloween treats, if I can find Halloween-themed wax paper. These seed packets are cut out of PTI Linen Vellum, PTI Vellum, and unbleached parchment paper (for baking). If I were a better photographer, you would see that the Linen Vellum looks pretty much like white cardstock, but the regular vellum and the parchment paper are somewhat translucent, which would be great if you want to show a partial view of the contents. Here are those same packets shown with something in them, so you can see how translucent each type is. Flip view of the last two. I stamped the back top portion before assembling. I used Scor Tape as my adhesive on all of them. Sorry about the length of this post, but I just had to share my excitement about this die. If you have any ideas about what I should do with all these packets, please let me know. I really liked the color scheme I used for the card I made yesterday, and decided to make another one, but mix it up a little. I used Hawaiian Shores as the primary color, and also heat embossed the pencil images. 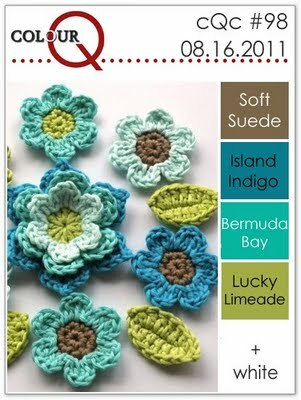 I will give this card to my youngest daughter at some point, since Hawaiian Shores is one of her favorite PTI colors. I will enter this card into the ColorQ Challenge #98, the CASE study Challenge #53, and the CAS-Fridays Challenge #16. It's a little hard to see in the photo, but the ribbon is a chocolate brown. Today I am combining three challenges into one card. I know many of you do this all the time, but for me, I feel like I just learned to juggle. 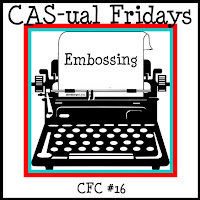 I am using the color scheme from this week's ColorQ challenge #98, the CASE Study Challenge #53, and this week's CAS-ual Fridays challenge to use embossing. I didn't have the exact colors called for in the color challenge, but I used what I had that was closest. I used Colorbox Chalk Harbor, VersaColor Turquoise and Distress Peeled Paint inks, Bazzil carob paper, a Hawaiian shores button, and some green ribbon I found in my stash. 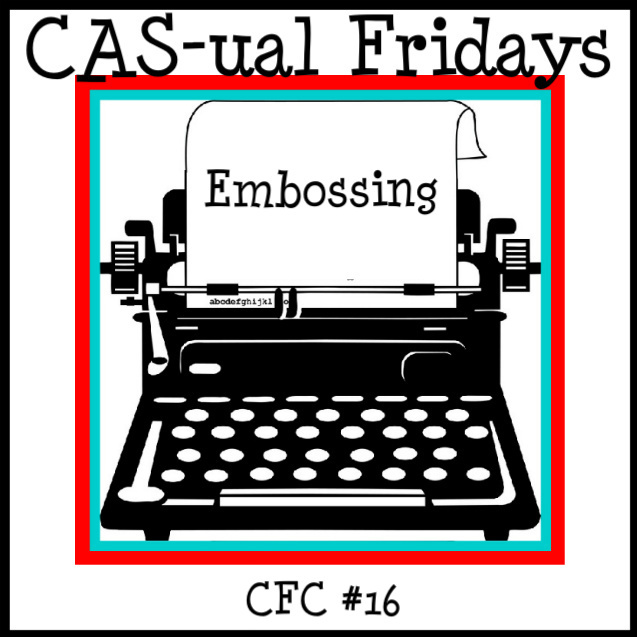 For the embossing challenge, I used my brand new Stampin Up houndstooth embossing folder. Here is the program: The 'hostess' for the month makes four kits and sends them out to each of the four of us. We work secretly to create a card using at least 4 items from the kit. No other rules or restrictions. We are allowed to use anything else we have on hand. We get to see each others cards today, on each of our blog posts. We are scheduling our posts to go live at the same time. I'm so excited to see what everyone did with the incredible kits Cathy sent out last month to get us started. Cathy made a kit using PTI Cupcake Collection, and sent us embossed cardstock in Berry Sorbet, Dark Chocolate, and Simply Chartreuse, plus lots of other die cuts and patterned papers. I wish I had thought to take a picture of the kit all spread out, but I didn't. Everything you see on this card was in the kit, with the exception of the little paper button. The kit had enough in it for me to make another card or two, which I will do at some point. This is a great way to get to play with a stamp set or other supplies that you don't own, don't you think? Please stop by their blogs, if you haven't been there already, and see what they have created for our first ever Four-of-a-Kind post. Don't miss the blog candy being offered on Cathy's blog--become a follower and leave a comment for all four of us to be eligible for this prize. Several months ago, I was feeling a bit guilty about the Tea for Two, Tea for Two Additions, and all the matching dies that had been sitting around unopened in my office for quite some time. As it turned out, my friend Cathy did not have these sets, and I offered to cut and stamp her some images. I figured it would be good for me to just get the set out and start to play, without the pressure of having to create a specific card. I sent the stamped images to Cathy, along with the patterned paper I had used as a color guide. I wondered what she would do with it. I ended up inspired to make several cards, and was completely tickled to see that Cathy had taken the exact same 'ingredients' and had come up with something so completely different. How fun to see a different take on the same stamp set. Then, the wheels started to turn, and an idea was hatched: Four-of-a-Kind. Come back tomorrow and see what we've cooked up. Start at Cathy's blog, then come back here and see what I've got for you.